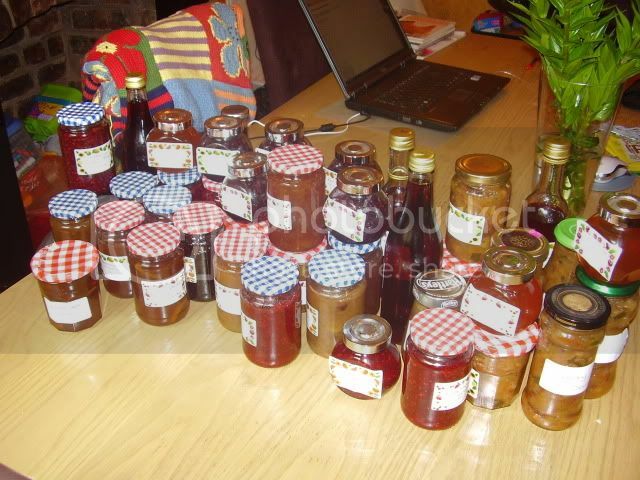 I have been very busy over the past few weeks making my chutneys and jams, predominantly with allotment produce. I have raspberry jam, raspberry and apple jam, raspberry and lime jam (my favourite), rhubarb jam, gooseberry and elderflower jam, strawberry jam, rhubarb and ginger jam, rhubarb and orange jam, pink grapefruit and ginger marmalade (not from the allotment), raspberry syrup, redcurrant jelly, white currant and mint jelly, blackcurrant jam, blackcurrant jelly, raspberry vinegar, beetroot and horseradish relish, gooseberry relish, rhubarb relish, green bean chutney and glutney (courgette and apple chutney). I also have my first batch of blackberry jam sat on the side (with lots left over in a bowl as I didnt do enough jars so the extra is destined for a victoria sponge and some jam tarts tomorrow) and the first kilo of my 10 kilos plus of crab apples is being turned into spiced crab apple jelly (it is in the jelly bag as I type). Also on the go I have two rumtops " one with brandy and one with a mix of gin and vodka (I couldnt remember which I had started it off with so used both). They are just waiting to be topped off with a pineapple next week. Hubby has been sent off out for more blackberries so I can make some blackberry and apple leather tomorrow and I am eagerly awaiting my friend with her damsons when they are ready so I can start my damson gin off. This afternoon I have had to have a big clear out of one of my cupboards to make more space to store them all. Some are destined for the allotment show on 4 September (the first time we are entering) and others for christmas presents. And what's left will go in my tummy. Here is some of my pile, waiting to be put away with the others. All looks lovely, just a shame I couldn't read the whole post. Problem is that for some reason photos need resizing so that some of us can read all the fonts, such are the vagaries of the computer world. me too but wow you have been hard at work; you'll be setting up a business and selling online like me before you know it! Ah - I wondered what the problem was. I will try to do it again! Nope - can't change it. But I will know for next time! Hi Debih - inserting links to your photos is easy once you know how. That's a most satisfying batch of produce. Makes me envious. Now that our house is cleared and tidied, I hope F has time to turn her hand to making more batches of stuff. I have begun to pluck the ripe plums, managing not eat too many. They are gorgeous. Must also revisit the locations of the wild plums and damsons. The elderberries outside my home office window are about 80% ripe now. beautiful black glistening bunches that shout "turn me into elderberry wine! ".